1. the subjection of a substance to prolonged heat and moisture, so as to soften and disintegrate it. 2. the act or process of converting food into chemical substances that can be absorbed into the blood and utilized by the body tissue. Digestion. 1. Carbohydrates: principally starches, lactose, and sucrose. Starches are acted on by the enzyme ptyalin (alpha-amylase) secreted in saliva, by hydrochloric acid (HCl) in the stomach, and by pancreatic amylase and intestinal amylase in the small intestine, which split the starches into maltose and isomaltose. These, in turn, are acted on by maltase and isomaltase and split into two molecules of glucose. Lactose is split by the enzyme lactase into a molecule of galactose and a molecule of glucose. The monosaccharides glucose, galactose, and fructose are absorbed from the small intestine into the blood. 2. Fats: emulsified by bile salts and agitation. The emulsified fats are acted upon by pancreatic and enteric lipase to form fatty acids, glycerol, and monoglycerides, which are absorbed through the intestinal walls. Small quantities of diglycerides and triglycerides are also absorbed. 3. Proteins: acted on chiefly in the stomach by pepsin, which splits proteins into proteoses, peptones, and polypeptides. In the small intestine they are acted on by the pancreatic enzymes trypsin, chymotrypsin, and carboxypeptidase to form polypeptides and amino acids. In the small intestine the peptidases complete the breakdown of the peptides into dipeptides and amino acids. Almost all proteins are eventually digested and absorbed either as amino acids or as dipeptides or tripeptides. See illustration. Digestion is accomplished by physically breaking down, churning, diluting, and dissolving the food substances, and also by splitting them chemically into simpler compounds. Carbohydrates are eventually broken down to monosaccharides (simple sugars); proteins are broken down into amino acids; and fats are absorbed as fatty acids and glycerol (glycerin). The digestive process takes place in the alimentary canal or digestive system. The salivary glands, liver, gallbladder, and pancreas are located outside the alimentary canal, but they are considered accessory organs of digestion because their secretions provide essential enzymes. gastric digestion digestion by the action of gastric juice. digestion/hydration in the omaha system, a client problem defined as converting food into substances suitable for absorption and assimilation into the body and supplying water to maintain adequate body fluids. intestinal digestion digestion by the action of intestinal juices. pancreatic digestion digestion by the action of pancreatic juice. primary digestion digestion occurring in the gastrointestinal tract. 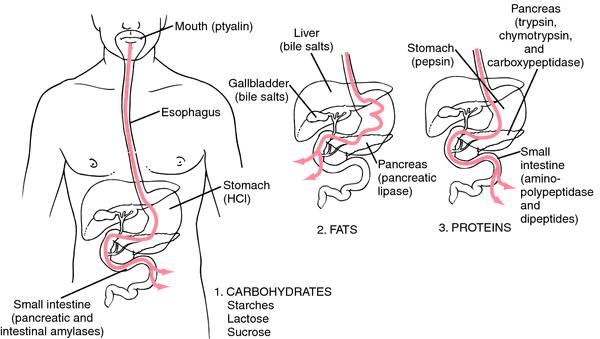 salivary digestion the change of starch into maltose by the saliva. the conversion of starch into sugar by the action of salivary amylase. Conversion of starch into sugar by salivary amylase. 1. the act or process of converting food into chemical substances that can be absorbed into the blood and utilized by the body tissues. 2. the subjection of a substance to prolonged heat and moisture, so as to disintegrate and soften it. Digestion is accomplished by physically breaking down, churning, diluting and dissolving the food substances, and also by splitting them chemically into simpler compounds. Carbohydrates are eventually broken down to monosaccharides (simple sugars); proteins are broken down into amino acids; and fats are absorbed as fatty acids, monoglycerides and glycerol (glycerin). The digestive process takes place in the alimentary canal or digestive system. The salivary glands, liver, gallbladder and pancreas are located outside the alimentary canal, but they are considered accessory organs of digestion because their secretions provide essential enzymes and other substances. differs markedly from mammals in the mouth; there are no teeth, dental functions being performed by the beak and the muscular gizzard; the esophagus, in other than owls and insectivorous species, has one or two crops, dilations where ingesta are held temporarily. most digestive processes in monogastric animals are enzymatic brought about by enzymes secreted into the lumen of the gastrointestinal tract and enzymes located at the brush borders of the intestinal epithelium. any disruption of the normal digestive process; caused by abnormal ingesta, either chemically or physically, or by an error in the physiological and biochemical processes which constitute digestion. digestion by the action of gastric juice. digestion by the action of intestinal juices, bile and pancreatic juice. the stage of the digestion of fats that goes on in the lumen of the intestine; as distinct from the mucosal phase that occurs in the epithelial cells. digestion by the action of pancreatic juice. digestion occurring in the gastrointestinal tract. characterized by the fermentative functions that are carried on in the forestomachs. Cellulose is readily digested with the output of short-chain fatty acids being the chief energy source for the animal. Nonprotein nitrogen is utilized by the ruminal bacteria for the manufacture of protein which is later available for the satisfaction of the animal's protein needs. the change of starch into maltose by the saliva; most marked in humans. see starch digestion test, lactose digestion test, gelatin digestion test.